If you’re new to machine needle felting, this is a perfect class for you. You’ll learn how to easily combine wool fiber and fabric scraps as well a fun quilting technique and a super easy fused binding. 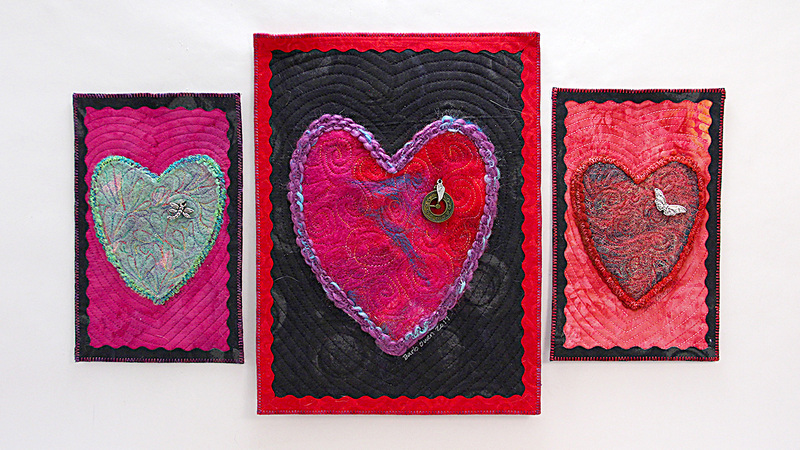 You’ll put it all together to create a beautiful mixed-media heart art quilt. Several months ago, a friend of mine experienced a serious heart attack. She and I have known each other for quite a few years as we are both members of a Fiber Study Group which is part of our local Weavers and Spinners Guild. I don’t weave or spin but I thoroughly enjoy sharing ideas and techniques with like-minded people who are interested in all kinds of fiber, so I joined the Guild to become part of FSG. When I got word of our member’s heart condition and her impending surgery, I felt helpless. I needed to do something for her, but what? One of the other members of the group decided to assemble a book of cards for her for Valentine’s Day and asked each of us to create a small piece of art containing a heart. Perfect! I can definitely do that . . . but what was I going to make? When I don’t have an idea, I pull out a lot of my favorite supplies in colors I enjoy using. My pile of wool roving begged to be a felted heart and that’s where I started. I often say that there must be magic in my supplies because I rarely have a specific outcome in mind when I begin. 😉 My only goal that day was to find a heart in the midst of the fluff and color on my table. Once a felted heart took shape, I decided to add stitching. As much as I love fibers, I also love using beautiful threads to enhance what I’ve created. Machine or hand stitches are equally beautiful and complementary with needle felting. Of course, I needed to add a charm or two before creating a background to hold the heart. In this class I’ll show you the entire process - step by step - including a pretty, no-sew binding technique. If you’ve never used a Needle Felting machine, this is a great class (along with How to Needle Felt Silky Fabrics s03e07 and How to Needle Felt Wool Roving s03e07) to show you how to combine disparate fibers together as only a felting machine can do. So, grab some fiber and fabric and make something beautiful for someone who needs a lift. PS - My recovering friend is doing well and loved all the fiber hearts from our group!